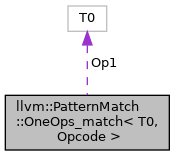 Definition at line 1028 of file PatternMatch.h. Definition at line 1031 of file PatternMatch.h. Definition at line 1033 of file PatternMatch.h. Definition at line 1029 of file PatternMatch.h.